Cream pies can be tricky. Most recipes must be made that day - who has time for that during the holidays?! This Chocolate Tart recipe is great (maybe even better...) the next day. It is a variation on the popular "Mississippi Mud" pie that was so popular when we were young. I dressed it up a bit by using a fluted tart pan, homemade chocolate 'pudding' and real whipped cream. To make the crust, preheat oven to 375 degrees. Chop pecans into small pieces by hand or in a food processor. In a mixer fitted with the paddle attachment, combine chopped pecans, flour and butter. Butter a tart pan or pie dish. Press the dough into the bottom and up the sides of the pan. Bake for 8-10 minutes. Set aside to cool. For the first layer of filling, whip together cream cheese and powdered sugar until it is smooth. Spread it into the bottom of the cooled crust. For the second layer of filling, combine sugar, cocoa, cornstarch and salt in a saucepan. Whisk in milk. Cook over medium-high, stirring constantly. Cook for 5-7 minutes until it is bubbly and thick. In a separate large bowl, whisk egg yolks together. Add a small amount of the chocolate mixture to the eggs and stir. Stirring constantly, continue to add small amounts of the chocolate mixture to the egg yolks until completely combined. Return to the saucepan and cook over medium heat just until it begins to boil. Stir in vanilla and butter until smooth. Pour filling over the cream cheese layer. Chill in the refrigerator. Make the whipped topping just before serving. Beat together cream and sugar until stiff peaks form. Spread on the top of the chocolate layer. With a vegetable peeler, make shavings of chocolate to garnish the whipped cream. I like to make the shortbread crust in the Kitchen Aid, but you can do it by hand, too. Press it into a tart pan or pie plate. After baking and cooled slightly, spread in cream cheese mixture. 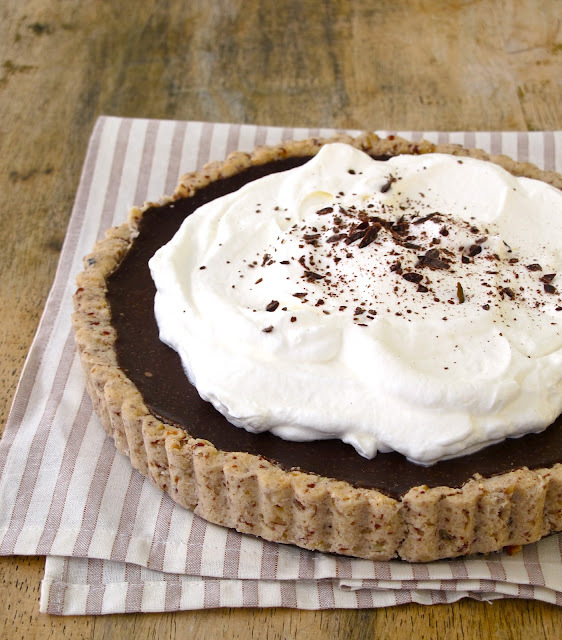 Top the pie with whipped cream and some chopped chocolate. oh my gosh- this looks obsurdly delicious. can't wait to try it out! I'm pinning it right now! It looks so amazing! Can't wait to make it at home! This looks great. I notice you call for cocoa powder, but you mention chopping up the chocolate for the chocolate layer? Should you use cocoa powder or chopped chocolate? Thanks! This recipe looks amazing! I'm excited to try it. This looks and sounds so delicious.....I can almost taste it! Please clarify the use of chocolate in the 2nd layer....cocoa powder or chopped chocolate. Thanks for all your wonderful recipes! pfowler610 - sorry, i tested a couple of recipes and i guess i put up some photos of another version that used chopped chocolate in the filling. the recipe i decided on uses cocoa - hope that clarifies! Just a friendly FYI- you spelled Chocolate as Chococolate right above the ingredient list. Cannot wait to make this, it looks delicious!